Stephen Bodio's Querencia: Save the Dioramas! I grew up looking at great dioramas, the magical combinations of painting and taxidermy that rose to a high art in the early twentieth century. Perhaps their highest expression is in two halls that depict the habitats and wildlife of North America and Africa in my favorite museum in the world, The American Museum of Natural History in New York. Every lover of "naturalist" art should make at least one pilgrimage to see them, but meanwhile, Stephen Quinn has written an excellent book that shows most of them and explains their genesis: Windows on Nature. Yesterday a good friend, the artist and sculptor Tony Angell, forwarded an alarming letter from Quinn. Apparently another unique set of dioramas in Minnesota, featuring painting by such masters as Francis Lee Jacques, is under threat of destruction by the usual flock of visually and historically ignorant illiterates who think change and trendiness trumps beauty and history. His is a long letter, but dense with information-- let me snip a bit. "I'm writing to inform you all of some disturbing plans that I have just learned about for the James Ford Bell Museum in Minneapolis, Minnesota. 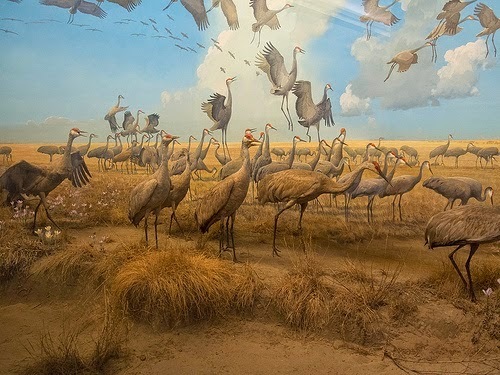 Many of you may know that the Bell Museum possesses what are, arguably, the most magnificent collection of natural history dioramas done by the great wildlife and bird artist, Francis Lee Jaques. 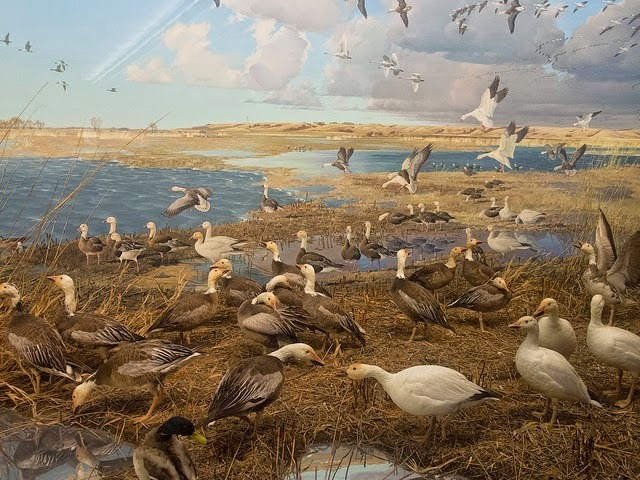 Also represented in this priceless diorama collection are the contributions of Louis Agassiz Fuertes, Robert Bruce Horsefall, Charles Abel Corwin, and pioneer diorama designer, famed Ornithologist and early conservation activist Frank Chapman. "Late in his career at AMNH, Jacques assisted in the design of the Bell Museum building to facilitate and assure its primary objective of optimum display for its dioramas and, through the 40s and into the 50s, designed, directed construction of, and painted the backgrounds for a series of dioramas that can be considered his best... Jacques was originally from Minnesota, grew up on its prairies, northwoods boundary waters, and hunted waterfowl on its, then, vast and wild wetlands... These scenes of thousands of Snow Geese over windswept marshes, Sandhill Cranes alighting on a spring prairie meadows, or majestic Moose in the northern lake country all evoke such a compelling illusion and sense of place and personal presence that one is struck by the ABSENCE of the cries of the birds or the chill of the north wind on one’s cheek when standing before them. "Sadly, I have learned last week that the Minnesota State Legislature has approved funds to build a new natural history museum on the University of Minnesota campus at Saint Paul and this new plan calls for gutting the interior of the Bell Museum in Minneapolis, an attempted removal of some of its unique collection of irreplaceable dioramas in order to “reinterpret” some in the new museum, and the possible storage or disposal of the rest. (Snip)"... to attempt to extract these great works from the alcove settings in which they were specifically designed and fabricated to be viewed in, is a folly and loss for the generations to come that will never see them under those intended conditions. Removed, "re-purposed", "re-interpreted", or "re-designed" to become "relevant" and "useful" to today's University of Minnesota, will inevitably mean that they will find themselves adapted as "open-air", "immersive", or "walkthrough" dioramas... they will become even more vulnerable to the whims of ambitious exhibit designers, short-sighted curators, and a nature-deprived public who, with a constant diet for the latest techno/interactive bombardment, cannot begin to understand their value historically, scientifically, or artistically as the remarkable replicas and record of a wilderness they can not comprehend, in this new setting." (Snip) "The James Ford Bell Museum is THE ONLY remaining building in NORTH AMERICA that was specifically designed, in its entirety, as a standing theater for natural history dioramas. It's very exterior structure; site plan and interior floor plan reflect this. It is superbly, and perfectly “fine-tuned” for this purpose. There are NO OTHER buildings like it in the US or Canada!!! As such, it is just as significant, both architecturally and artistically, as the Biological Museum of Gustaf Kolthoff and Bruno Liljefors in Stockholm, Sweden, and the grand Akeley Hall of African Mammals or the magnificent Hall of North American Mammals in New York.... They were all created by the great naturalists/artists/ scientists and educators of their time, requiring extensive and costly travel and expeditions, unique and groundbreaking fabrication techniques, and embraced a mission to present an illusion of nature so powerful and compelling that, it can be argued, they will NEVER be equaled again. (Snip) "We MUST all spread the news of this impending tragedy with a letter-writing campaign to the critical individuals involved... The threat to that building and those dioramas needs to be clearly known and it’s loss clearly recognized and understood by all who are making this decision. "... Also, notably, I have learned that the University, itself, does not view the dioramas favorably, but sees them as “archaic and old” and does not consider them a priority in the plans for their future museum, and would prefer not to address them at all. What is to prevent the University from, in the future, allocating funds away from the dioramas, sighting the VERY high costs for the proper removal, conservation, and reconstruction of these dioramas as not worth it?... In a relatively short time, they are likely to be considered diminished in value and therefore disposed of." One afterthought: friends and scholars-- Jonathan Kingdon, John McLoughlin-- and writers and scientists I have never met-- Stephen J Gould, Ed Wilson, Richard Dawkins-- have all written in praise of the traditional museum that formed and nurtured them. Do ultramodern, interactive, "Game"- themed, info- free installations have any such potential? Without the Harvard and later, New York Museums, I don't know that I would have the interests I do today, or this blog. I don't know if it is the taxidermy or the color difference between the taxidermy animals and the painted ones. There is a magic set of Dioramas at the Norwich Castle Museum , UK, which were installed by the naturalist Ted Ellis, when he was curator. ( I was privileged to be a committee member of the Ted Ellis Nature Trust for several years, and knew Ted well). These thrilling panoramas of the inhabitants of the unique Norfolk Broads are magnificent, and continue give inspiration to countess generations of potential nature lovers. Thanks for ruining my day? Well no, but thanks for bringing it to my attention. One annoyed architectural historian/historian will write a letter here...not that it will do any good! A classic case of; if it ain't broke, don't fix it! I, too, have always loved these dioramas....L.B.